I haven’t read the novel by Lauren Weisberger upon which the film is based, but I think I’ll give it a go if ever I get my hands on it. 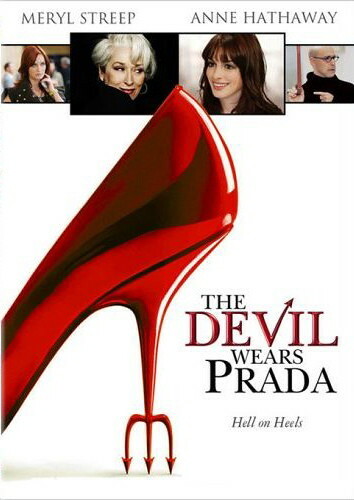 It’s a fun story, and, if I’m not mistaken, is based loosely on Weisberger’s own experience as an assistant to the chief editor at Vogue magazine, who, like Meryl Streep’s character in The Devil Wears Prada, was apparently a self-absorbed tyrant. When I saw the trailer for the movie, I laughed myself silly. Rather then show us all the big plot points of the film – as so many trailers wrongfully do and thereby divulge the plot from beginning to end – we see a two minute clip from the beginning of the film when the young, naïve journalist-to-be, played by Anne Hathaway, meets the dragon lady that is Meryl Streep. It was hilarious. Stanley Tucci was spot on as Streep’s lieutenant, and Hatheway did her Princess Diaries thing, which is to stand there shoulder slumped with that sweet smile, looking as innocent as possible. When Lauren and I rented the DVD, we watched the first half one night and the second half the next. Sadly, the second half didn’t measure up to the first. The reason the filmmakers made the trailer they did, I realized, was because the beginning of the film is so much more enjoyable than the rest of it. Lauren and I quickly tired of Hatheway’s charcater. We stopped caring about whether she’d survive her year at Runway, the fictional magazine, or not. She became one of those characters that tinkers with the dark side before learning in the end that she was all right to begin with. She makes this realization, however, after making some rather stupid mistakes and silly wardrobe selections. What annoyed me most about the film was the character played by Emily Blunt. She was Streep’s other assistant, one corporate ladder rung above Hatheway. It wasn’t Blunt’s performance that bothered me; she was fantastic. The writing that was to blame. Blunt’s character was simply too mean, too icy. And even more puzzling was how forgiving Hatheway seemed to be toward her. Hatheway continued to talk to her as if they were best buds, as if Blunt’s iciness were nothing at all, really. It didn’t work. If someone is that mean to you, you don’t talk to them; you avoid them. Why risk getting yelled at again, or chastised, or have eyes rolled at you? No, Hatheway’s treating Blunt as a friend was dumb, one of those unforgivable writing errors that you just can’t get over. As for Meryl Streep, she was fabulous, even allowing herself to go on camera sans makeup for one pitiful little scene. I suppose that seems a trifle thing, to go on camera without makeup, but in the world of Hollywood where looks rule, it seemed a brave thing to me. Sure actresses become ugly occasionally, as Nicole Kidman did for The Hours. But in those instances we see a “made up” ugly; the ugly part is fake, fabricated. We never forget for an instant that beneath that false nose, Kidman is as gorgeous as ever. And so we see past it; we forgive. Not the case with Streep. Streep showed her own ugly, her true self not made up, and that’s different. That takes an extra measure of guts. Overall, it was worth the rent but certainly not a movie we’ll be adding to our library.